I liked this book. I would have preferred some more depth with some topics, but it was a nice wrap up of the era.It showed what changed and what stayed the same. We get to know different aspects of society, the differences between the classes, school systems, ethics and even a bit about the empire. There is some information towards race issues and how they changed (from culture to biology, e.g. originally Indians were considered culturally inferior in Victorian times not biologically and the differences between workers and aristocracy in England were seen due to biology and not nutrition), but these things (like the empire) were not the main focus of this book, so you won't find stuff about the Opium wars since they didn't affect everyday Victorian life that strongly as it seems. But you do get to know about what state England had in that time, what changed regarding transportation, public hygiene, morality, food etc. etc.There is so much in this book that it is not something for casual reading, it isn't hard to read or anything, but it covers a lot of topics so you have to keep attention to it and can't do it halfheartedly.As an intro to the Victorian era I would definitely recommend it, but for more in-depth looks you would need other literature that is more oriented towards specific topics. Thorough overview of everyday life. Very informational and easy to read. Evangelical churches in the US, by many associated today with religious fundamentalism and all its corollaries, took their present-day form in the XIXth century. Is it not, then, highly ironic and paradoxical that in England “evangelicals abolished the slave trade, ended flogging in the army and navy, got rid of public hanging, strove to convert criminal justice from ‘punishment’ to ‘reform,’ established schools, cleared slums, built decent housing for workers, abolished blood sports and protected animals from cruelty, worked steadily toward raising the age at which children could work full-time, founded refuges and orphanages, built schools for the mentally and physically disabled, and rethought the treatment of insanity” (256)? This is an amazing book for what it is. It's an introductory book. With all their topics, there is no real way to really dig into too much. I can't tell you how many times I've dug this book out (particularly for the table of careers and general pay grades) to either reference something, or give it to others to look through for their projects. While it's not a book that I would say is the only one you need, particularly if you're obsessed, like I am. I do fully believe that it is one of the staples in my little cubby of Victorian Nonfiction. This book is one that I will hand out to those who are just starting to study or show interest in the Victorian period. Chapters include: Brief History, Class, Tradition, and Money, Working Life, Technology, Official Life (Government and Law), Private Life, Social Customs, Education, Medicine, Leisure and Holidays, Religion, Military, and Victorian Morality. This book contains lots of details about the Victorian Era and is very interesting and informative about the everyday life of people in every class. Although in a fairly scholarly format it lacks footnotes but does include a glossary and “Further Reading” sections as well as a useful appendix directing readers to other resources including online. "Daily life in Victorian England" is delightfully informative while remaining interesting and immersive. Join Mitchell on her tour through Victorian England's ups and downs as she introduces us to the curious and familiar habits of England in a crucial time of it's existence. Playfully switching between her own research and sources of the time itself she succeeds in shaping a clear image of the time in such a way that you will not be able to put the book down after you have started. A very approachable look into Victorian society. Sources are cited but do not bog down the reader, yet the lack of pages following pages of numbers do not lower the level of the information presented. Overall, I found this a delight and I found it a useful resource for assisting with Victorian novels. A FANTASTIC research tool for those interested in the Victorian period. I already had substantial background, but this book taught me many facts which were completely new to me. Structured very intelligently and written so that all can understand, I found this an invaluable writer's resource. Thanks Ms. Mitchell, for doing all the work so that we don't have to! An interesting look into Victorian society in England. The author takes care in weaving an interesting non-fiction narrative that is not overly biased. This book may seem dry to some and boring to others (who may know about the Victorian age already), but is still worth the read if you have interest in the social aspects of this period of history. From the title I was expecting more of an intimate description of the general activities and daily routine of Victorian families. However, the book is full of interesting information, albeit rather in textbook style than casual reading material. A great reference book for anyone researching the period. This was a great behind the scenes of Victorian England - whether you are a follower of Victorian era television, books, or just a history buff wanting to know more about the lives of people before us. I especially liked that there was a decent listing of books for further in-depth reading. 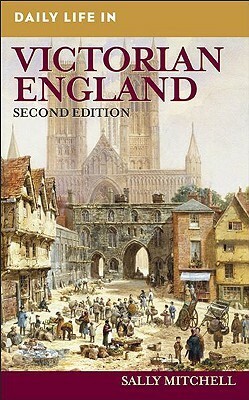 An entertaining and easy-to read over-view of Victorian England. Good for getting a general picture of the era. It's an American book so I did find certain things amusing, like having cricket explained.Don't expect in-depth analysis of events, and treat it more as a primer. A great book for helping you get more from most Victorian novels and many Masterpiece Theater productions. Excellent resource for a writer of historical fiction. Very interesting. Some of what we thought life was like back then is incorrect according to this book. Just wish I could remember everything I read. Sally Mitchell - Sally Mitchell is Professor of English and Affiliated Professor of Women's Studies at Temple University. She is the author or editor of several books on 19th century England.